Is tousled and rough. Colors can be white with any combination of orange, lemon, girzzle, or tricolor markings. This breed, despite its appearance, is very terrier-like in temperament. It is inquisitive, busy, tough, and always on the lookout for opportunities to explore, trail, and dig. This breed, despite its appearance, is very terrier-like in temperament. It is inquisitive, busy, tough, and always on the lookout for opportunities to explore, trail, and dig. This dog is friendly toward strangers, other dogs, children and pets. You can find Petit Basset Griffon Vendeen puppies priced from $1500 USD to $1500 USD with one of our credible breeders. Browse through our breeder's listings and find your perfect puppy at the perfect price. This dog is friendly toward strangers, other dogs, children and pets. The coat needs weekly brushing and tidying of straggling hairs. The PBGV can be stubborn and independent. Consistency in training is important. Exercise requirements can be met by a good walk or a romp in the yard. Petit Basset Griffon Vendeen Puppies for Sale - Shipped Worldwide! Finding the right Petit Basset Griffon Vendeen puppy can be dog gone hard work. PuppyFind® provides a convenient and efficient means of selecting and purchasing the perfect Petit Basset Griffon Vendeen puppy (or Petit Basset Griffon Vendeen puppies) from the comfort of your home, 24 hours a day, 7 days a week. Take advantage of our PuppySearch or leisurely browse our directory of hundreds of dog breeds, Petit Basset Griffon Vendeen dog breeders, Petit Basset Griffon Vendeen dogs for adoption, and Petit Basset Griffon Vendeen puppy for sale listings with photos and detailed descriptions. Some Petit Basset Griffon Vendeen puppies for sale may be shipped Worldwide and include crate and veterinarian checkup. 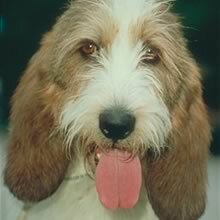 Many Petit Basset Griffon Vendeen dog breeders with puppies for sale also offer a health guarantee. With thousands of Petit Basset Griffon Vendeen puppies for sale and hundreds of Petit Basset Griffon Vendeen dog breeders, you're sure to find the perfect Petit Basset Griffon Vendeen puppy.